This book presents a very entertaining history of vampires, vampire literature, vampire movies, and explores vampires in pop culture. 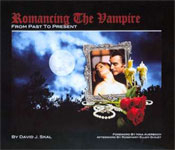 This book is LOADED with photos from many vampire movies. It's more like a scrapbook than a typical book. There are lots of pockets with removable mini movie posters, stickers, photos, and maps. There are quite a few treats for fans of Bela Lugosi and Dracula.